This eagle more or less flew into the frame while I was taking shots of the sky. I had to drive into work today to work with the debate team—which was unexpected. It wasn’t what I intended for the day, but we have a competitive meet tomorrow. So I grabbed my camera and went to get the work done. On the way home, I pulled over just to photograph a dramatic sky. While I was standing on the shoulder of Back Road, my camera in my hand, an eagle flew by directly in front of that sky and quite close to me. I think one of the secrets of life is simply to find out what the world is becoming and help it. I judge whether I’m on the right path to some degree by the amount of serendipity I encounter. Though hard work is required, the best things that happen are often very easy. 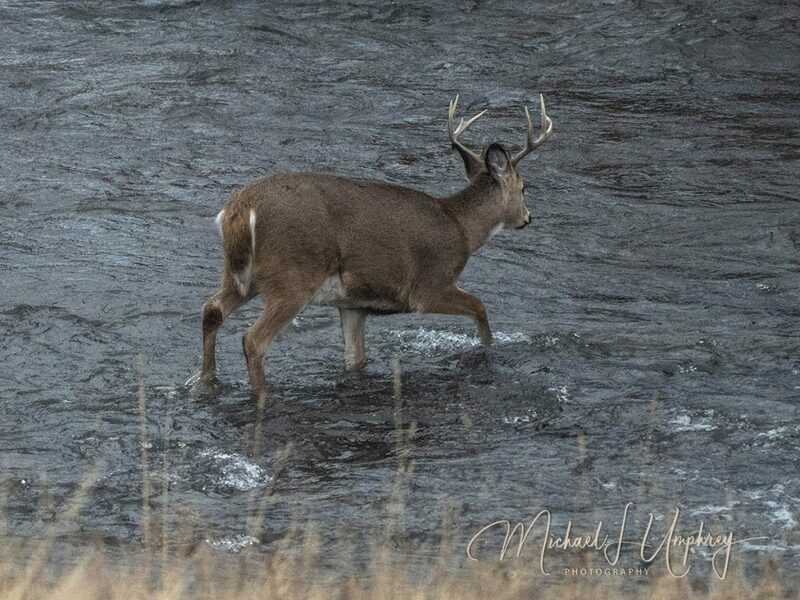 An early morning buck does his own New Year’s Day polar plunge. I didn’t have to work today, so I made it out in the field at dawn (which is 8:00 this time of year). I saw more bucks than usual—they tend to lay low during the day. These winter dawns are not spectacular. Heavy overcast, so I couldn’t even tell when the sun did come up. I could just tell it was getting lighter. No color. It was 28° which is warm for January. I saw a couple of eagles and several hawks, as well as a lot of geese and ducks. I was wearing ear buds to listen to an audio book, Ancient Civilizations of North America by Edwin Barnhart, and I wondered whether that was the right way to experience the morning. I decided he was good company. We don’t know the real history of this place, and I’m grateful for people who are working on that. I was surprised at a gathering of eagles this time of year in this valley. I occasionally see one or two, but I was told there were at least eight in a tree north of town. I went to see what was attracting them—they show up when calving starts, but it’s too early for that. What had drawn them was carrion. 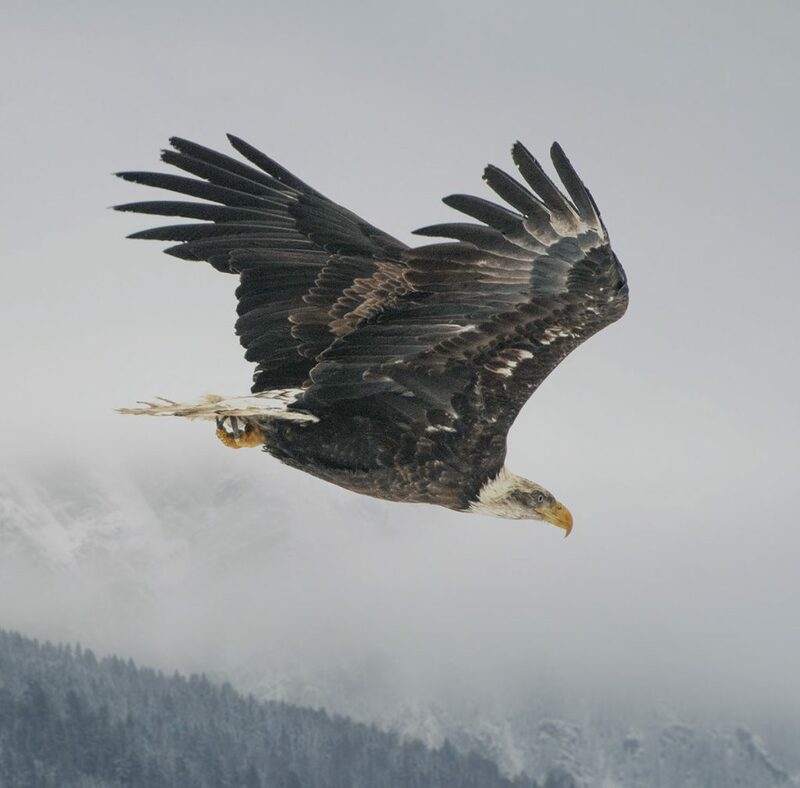 About 100 yards south of the tree where they were perched, other eagles and many crows had converged on something—most likely a deer that had been hit by a vehicle but ran a short distance before falling. I wasn’t surprised that it was carrion—most likely roadkill—that brought a convocation of the big birds to the valley this time of years. The bald eagles are very good looking and lazy. They prefer scavenging or stealing food from other birds, such as ospreys. Only as a last resort do they hunt. They’ve long been an important symbol in North America, though it’s not their opportunism that attracts the glory. They are capable of taking muskrats, hares, pheasants, ducks, gulls and Great Blue Herons, but they are also fond of garbage dumps in Alaska. 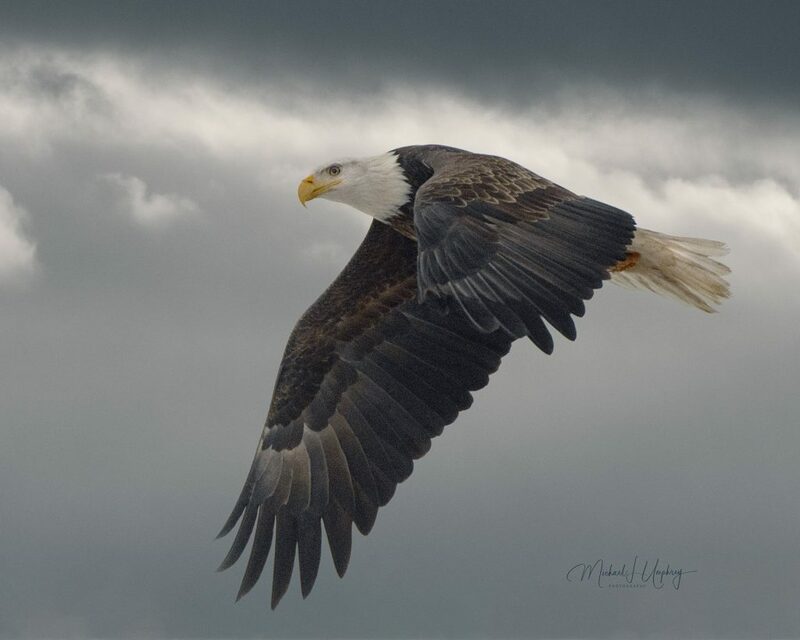 Americans see them as symbols of a martial spirit in defense of freedom. I sort of like the symbolism of a charming loafer. I’m glad their populations have rebounded after huge losses during the 20th century. There’s a lot we don’t know, such as how they might adapt to the increasing human development of landscapes near large bodies of water, which are favorite nesting sites. They like to keep their distance from people. Sometimes “prey” can be as heroic and transcendent as “predator.” Predators exemplify focus, locking in on one thing. But the hunted exemplify a wider awareness, scanning the Surround for threat. 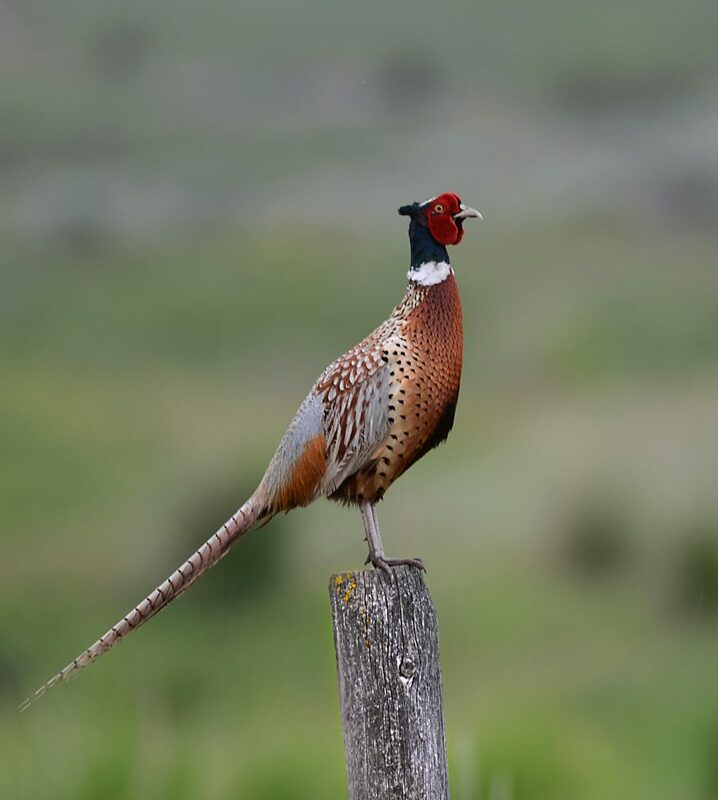 Sometimes, the hunted seek high perches so they can see farther, enlarging their awareness of what is out there rather than simply cowering in a concealed place. The question was “what was the most important thing you didn’t learn in school?” My immediate response was “how to steal fire from the gods.” School has interfered with my education at least as much as it has contributed to it. All that time—all those annoying assignments wasting time, the essence of life, in ways that might have a point in some totalitarian dream. One of the more important things I’ve learned has been how to steal fire from the gods—a task I haven’t heard explicitly mentioned in any classroom. Eric Voegelin is best on how that works: great artists perceive in the metaxy some cosmic order. We all have glimpses of the eternal way things are, but our greatest artists give those glimpses tangible form in an artifact that others can experience. This brings the divine order within reach of people who are building an earthly order. Such glimpses occur in proportion to the amount of time we spend in nature, trying to see. Nature is the great text of this world. But it is not a simple text, and we see much farther into it when we study the heritage of great literature that we have. The history of humanity has been a long process of waking up, and we latter-day have more riches available than we have time to access. A simplified formula: All civilizations are formed around a core of great literature. The source of all great literature is divine revelation from the Beyond. To be fair, I have done a lot of reading in response to school work, and that reading has been vital to all my most important learning. In my best classes—those taught by professors who enthusiastically knew more than they could say—I read many more book than I was assigned. But it has been writers who have been my primary teachers. From Solzhenitysn I learned that one person who refuses to lie can bring down a corrupted regime. What vitally important knowledge! The old tyrannies of this world will all burn in God’s holy fire, when we have learned what it is and how it work. Such things have not been talked about in the schools I had access to. 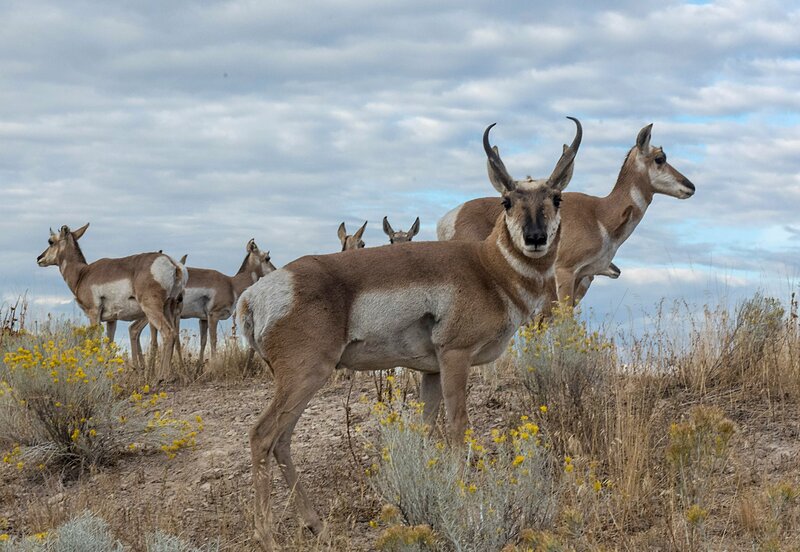 The pronghorns have outlived the Pleistocene predators that once hunted them by 10,000 years. The females can run up to 70 miles per hour. The pronghorns are the only survivors (besides the timeless coyotes) of the Pleistocene that we still see on the Great Plains. They now have no predators (except when they are fawns) because they can run up to 70 miles per hour and the fast cats that were once here have been gone for 10,000 years. A strong “sense of place” is often made mainly of a sense of time. Pronghorns were not long ago here in the millions, sharing the vast savanna landscape with bison, elk, grizzlies, and wolves. And before that with mammoths, ground sloths, stag-moose, saber-toothed tigers, giant American lions, short-faced bears, and 200-pound American cheetahs.